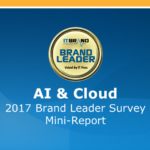 SAN DIEGO, CA—May 31, 2017—IT Brand Pulse, a trusted source for research, data and analysis about data center infrastructure, today announced the results of the recent IT brand leader survey covering AI & Cloud products. In the last two years that the private-versus-public Cloud Backup survey has been conducted, AWS trailed in second or third place for Market leadership. Fast-forward to 2017: AWS not only claimed the Market Leader award, but went on to sweep the entire product category (Price, Performance, Reliability, Service & Support, and Innovation). Microsoft Azure Cloud Services stayed just ahead of Veeam—the 2016 co-champion with EMC—to finish as the number two Market Leader. AWS unseated another two-time winner (HPE) in the Private & Public Cloud Dedicated Enterprise Servers to gain this year’s Market Leader. AWS also secured Price, Performance, Reliability, Service & Support, and Innovation. Microsoft Azure Cloud Services came in as Market Leader runner-up, in front of HPE. Though AWS earned three titles in last year’s Private & Public Cloud Enterprise Class Storage survey, Market Leader was not among the accolades. In 2017, AWS leaped past reigning EMC (now Dell EMC) by nearly a 2-to-1 margin to take Market leadership. In addition, IT professionals voted AWS to top the remaining five categories: Price, Performance, Reliability, Service & Support, and Innovation. Dell EMC—slipping to second place Market Leader this year—managed to best the other dominant challenger in these Cloud surveys, Microsoft Azure Cloud Services, which filled in the third spot. Dell EMC interrupted an AWS clean sweep of the private/public category matchups by holding on to its 2016 achievements for Private & Public Cloud SSD Storage. Respondents picked Dell EMC’s All Flash Arrays for Market, Price, Performance, Reliability, Service & Support, and Innovation awards. NetApp/SolidFire entered second place as Market Leader, with AWS following in third. In the first-ever brand leader survey for this product category, Cylance emerged as Market, Performance and Innovation Leader, while Sophos captured the Price, Reliability, and Service & Support honors. SentinelOne ended up in the number three Market Leader position, behind Sophos. Like its AI-related counterpart, Endpoint Protection is another newly-added survey segment for 2017. 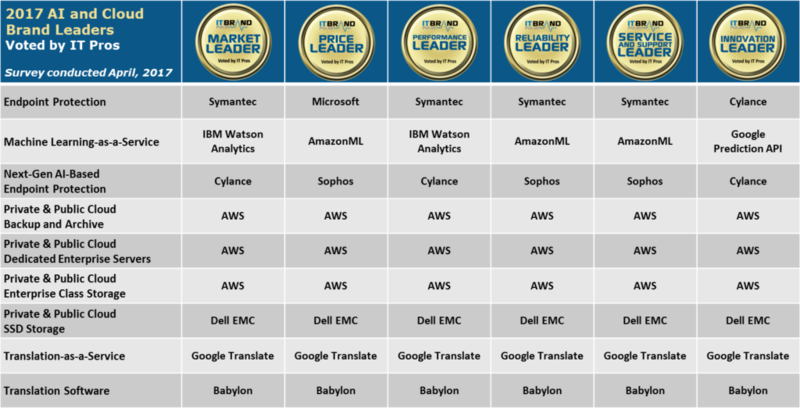 Symantec carried its security-brand familiarity to land Market, Performance, Reliability, and Service & Support leadership; leaving the Innovation title to Cylance (which it also achieved in the AI category), and Price to Microsoft. McAfee/Intel was next for Market Leader; Cylance was third. Artificial intelligence—with its many applications—is clearly one of the most compelling industries in technology today. In the Machine Learning-as-a-Service category, end users split their opinions on leader distinctions: IBM Watson Analytics for both Market and Performance; AmazonML (the Market runner-up, preceding Google) for Price, Reliability, and Service & Support; Innovation to Google Prediction API. For Translation-as-a-Service, global IT pros cast more than 50% of their votes to Google Translate in each of the six leader categories: Market, Price, Performance, Reliability, Service & Support, and Innovation. Microsoft Translator and BabelFish rounded out the top three, respectively. Garnering nearly half of the ballots for Translation Software, Babylon collected all available awards (Market, Price, Performance, Reliability, Service & Support, and Innovation). OneSky and NeuroTran finished second and third as Market Leader, in that order.